We are proud to announce that partners Howard L. Gum, David R. Hillier, and Patrick S. McCroskey have been included in the 2016 edition of Best Lawyers in America©. Howard Gum has been included in the list since 1993 and was named Asheville’s Lawyer of the Year in Family Law in 2014. Patrick McCroskey has been included in the Family Law Section of the list since 2007 and was named Asheville’s Family Law Lawyer of the Year in 2015. David Hillier made his appearance on the list first in 2008 and was named Asheville’s Bankruptcy “Lawyer of the Year” in 2013. Patrick McCroskey is a North Carolina Board Legal Specialist in Family Law and Fellow in the American Academy of Matrimonial Lawyers. Patrick has consistently been recognized through peer review in the Business North Carolina’s Legal Elite, and in Best Lawyers in America© since 2007. Patrick was listed in Super Lawyers Super Lawyers™ Rising Stars in 2009 and on their main list since 2012. Patrick holds an AV Preeminent Rating from Martindale-Hubbell. Established in 1979, Gum, Hillier & McCroskey, P.A. is an Asheville-based family and bankruptcy law firm serving clients in western North Carolina. The firm helps individuals and families create lasting resolutions to conflict and crisis. The partners in the firm are North Carolina Board Certified Legal Specialists in their respective fields of family and bankruptcy law, and are mediators and arbitrators. As legal specialists, the partners welcome referrals of family and bankruptcy law matters and are commonly associated by their peers on complex matters in their individual fields. 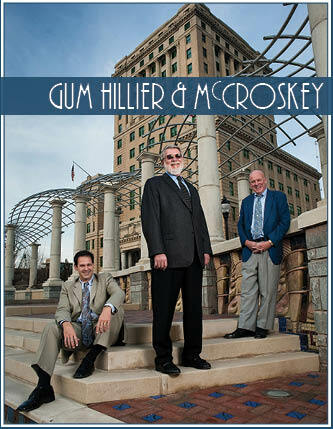 To find out more about the Gum, Hillier & McCroskey firm, visit the website at https://gumandhillier.com.